Email signatures are a standard feature in most email applications, and you may add one to your Yahoo Mail account with a few changes to your settings. An email signature in Yahoo Mail is automatically appended at the bottom of every reply, forward, and new message you create. These instructions detail how to add an email signature in the updated version of Yahoo Mail. Click the Settings icon in the upper right of the screen. From the menu, click More Settings. In the left menu, click Writing email. In the Writing emails section to the right of the menu, under Signature, locate the Yahoo Mail account you want to add a signature to and click the switch to the right of it. This action opens a text box beneath it. In the text box, enter the email signature you want to be appended to email messages that will be sent from this account. Choose from several formatting options, including bolding and italicizing text; changing the font style and font size; adding color to text, as well as a background color; inserting bullet points; and adding links. Examine a preview of how your signature will appear in the Preview message box. When you have completed entering your signature and are satisfied with its appearance, click Back to inbox in the upper left. Your signature is saved automatically, so there's no save button you need to press. Create a sample message to verify that your signature appears as intended. 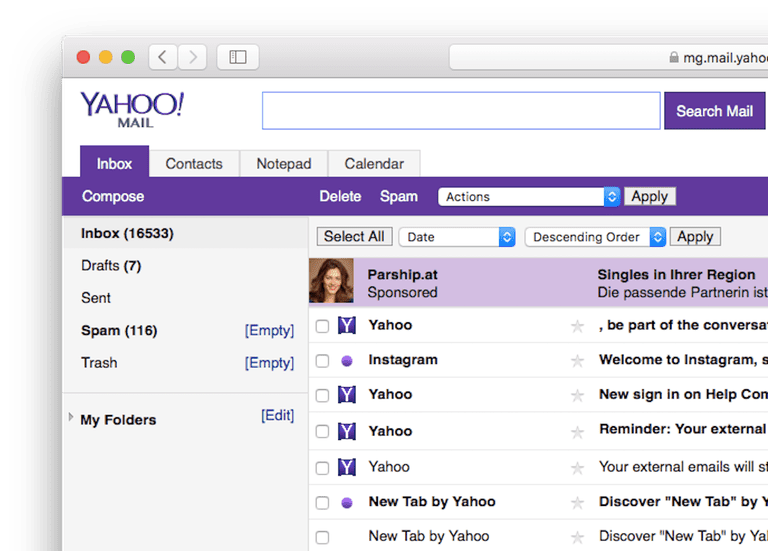 There is a stripped-down version called Yahoo Basic Mail, and in this version there are no formatting options for emails or signatures. If you're in this version, your email signature will be in plain text. If you no longer want to automatically include a signature in your emails, you can easily turn it off by returning to the signature settings. Select Settings > More Settings > Writing email and toggle the switch next to your Yahoo Mail email address to deactivate your signature. The signature editing box will disappear; however, your signature is saved in case you want to reactivate it later. If you use the Yahoo Mail app on your mobile device, you may add an email signature through it as well. Open the Yahoo Mail app then tap Menu > Settings > Signature. Tap the switch in the upper right corner of the screen to enable the email signature. Tap inside the text box. The default signature message, "Sent from Yahoo Mail..." may be deleted and replaced with your signature text. Tap Done, or if you're using Android, tap the Back button to save your signature.